A Back To School Drive has been suggested as a project for the Community Development Corporation by several community members. In researching this project, it was determined that students’ back to school needs have changed. Most parents need only purchase a backpack and lunchbox to prepare a student for the next school year (as far as school supplies are concerned that is). Pencils, pens and other supplies are available at the school for both teachers and students. These supplies are supplemented by the St. George Parents Group. With this in mind, we began to explore ways to meet the backpack/lunch box need for local families. It is difficult with these first round projects to know just what the need for assistance will be. In an effort to not over prepare and find ourselves with hundreds of backpacks and lunchboxes without children that need them, the idea to use a postcard to families was hatched. 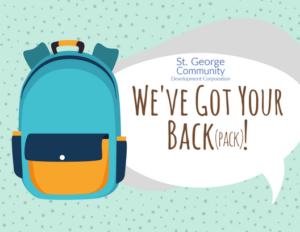 Before the end of the 2017-2018 school year, the St. George Community Development Corporation distributed We’ve Got Your Back(pack)! postcards to every student in grade K-5 at St. George School. Additional postcards were provided to the school’s Social Worker to distribute to families that she identified as possibly having a need. For the cost of a stamp or a 5 second stop at our offices at 47 Main Street, families in St. George can request a backpack and lunchbox for their St. George School student. St. George School went into session on September 4th this year. Before the start of school, the St. George Community Development Corporation and one private citizen provided 6 new lunchboxes and backpacks for school students. First-year success!